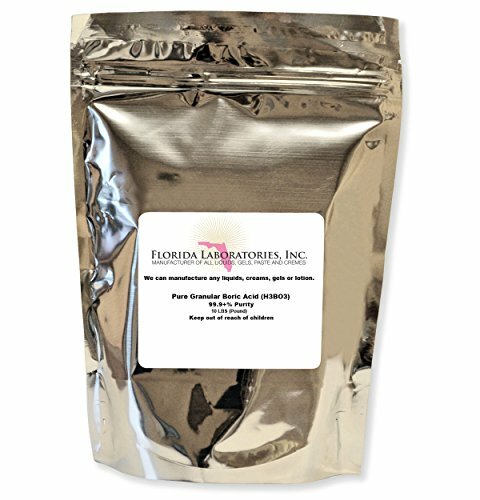 Details: For over 14 years, Florida Laboratories has been dedicated to continually improving existing formulas and developing new products to meet market needs.We are committed to ongoing research for new and improved products and have implemented continuous laboratory quality assurance testing of all products to confirm the high standard we expect from our raw materials and finished products.We are pleased to offer you the finest raw materials available for your needs on the planet. Packaged in heavy duty resealable food grade ziploc type bag for convenient ability to open and reseal the bag after each use. You are buying Ten Lb (10 Pound) Pure Granular Boric Acid (H3BO3)99.9+% Purity. Caution: Keep away from Children.First Aid Treatment: If in contact with skin or eyes, wash with running water if inhaled, move person to fresh air. If ingested, drink water to dilute material in stomach. Observe individual. If symptoms develop, seek medical attention. Precautions: Wearing loose fitting clothes and gloves is recommended. Use goggles. If there is heavy dust occurrence, use protective mask. Use with adequate ventilation. Store in a cool and dry place.